It has been two weeks since I finished reading this book. What an extraordinary reading experience it has been. It is an incredible story of a seeker who eventually becomes a revered seer. The blurb gives a quick idea of what readers should expect from the book. 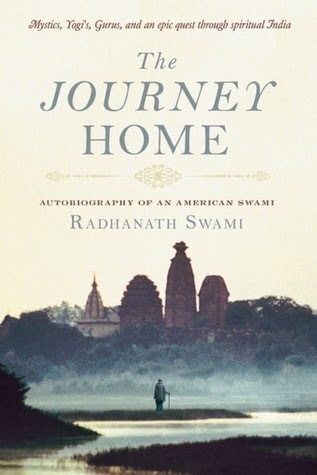 “Within this extraordinary memoir, Radhanath Swami weaves a colorful tapestry of adventure, mysticism, and love. Readers follow Richard Slavin from the suburbs of Chicago to the caves of the Himalayas as he transforms from young seeker to renowned spiritual guide. The Journey Home is an intimate account of the steps to self-awareness and a penetrating glimpse into the heart of mystic traditions and the challenges that all souls must face on the road to inner harmony and a union with the Divine. Can you imagine a desire for spiritual knowledge in a person so strong that he could hitchhike from Europe to India with almost no money? Sound incredulous, right? Those were exactly my thoughts when I came to know about the way Richard (later known as Radhanath Swami) reached India. The year in 1970 and the author, then only 19 years old flies to Europe with friends. He is a Jewish American who lives in Chicago with his family. At that time, he is immersed in the hippy culture, but something is constantly nagging him. While he is in Europe with friends, he suddenly has a strong urge to satiate his spiritual quest. With practically no money in his pocket, he travels from London to some popular European destinations like Amsterdam, Florence, Athens, etc., and finally Crete where he decides he must visit India. Since, he has no money for a ship ticket or for airfare; he decides to hitchhike to India via Turkey. His journey is filled with various encounters and experiences that will make you wonder about the person’s determination. So determined Richard was about his quest that he kept on moving towards his goal with conviction and determination. I am totally in awe for him and his life story. The book gives you some of the very important lessons about life. It is an inspiring and enlightening story that could help many seekers like him in their quest. I received this book from Jaico publishers in exchange for an unbiased review. This book was originally published by Mandala Publishing in the United States in the year 2010. It was first published in India by Jaico in 2013. Radhanath Swami was born in Chicago in 1950. In his teens he set out to wander the world on a spiritual quest, eventually discovering yoga path of devotion. He presently travels in Asia, Europe and America teaching devotional wisdom but can often be found at his community in Mumbai. People who know Radhanath Swami speak of his dedication to bringing others closer to God. Almost in the same breath they speak of his lightness, simplicity and sense of humor. Visitors and friends are inspired by his unassuming nature and natural unwillingness to take credit for the works he inspires - community development, massive food distribution to indigent children, missionary hospitals, eco-friendly farms, schools, ashrams and emergency relief programs.